The Accreditation process is not onerous. Complete a business self-audit using the checklist provided. This allows you to determine if your disclosures and practices are in line with the Code’s expectations. Make a statutory declaration to confirm that your disclosures and practices are compliant with the Code. Submit your application for assessment. 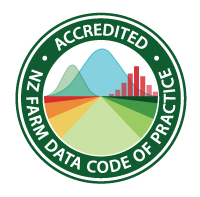 If approved you’ll receive an annual licence and certificate, and be provided with the Farm Data Code of Practice trademark for your use. Accreditation is reviewed annually. Organisations complete the self-audit and submit the Application for renewal of their licence.